After abandoning his early career as a contributor to Punch and the Illustrated London News, Myles Birket Foster (1825-99) went on to establish his reputation as a painter of technically skilled and highly polished watercolours, depicting landscapes and rustic subjects from Scotland to the Mediterranean. 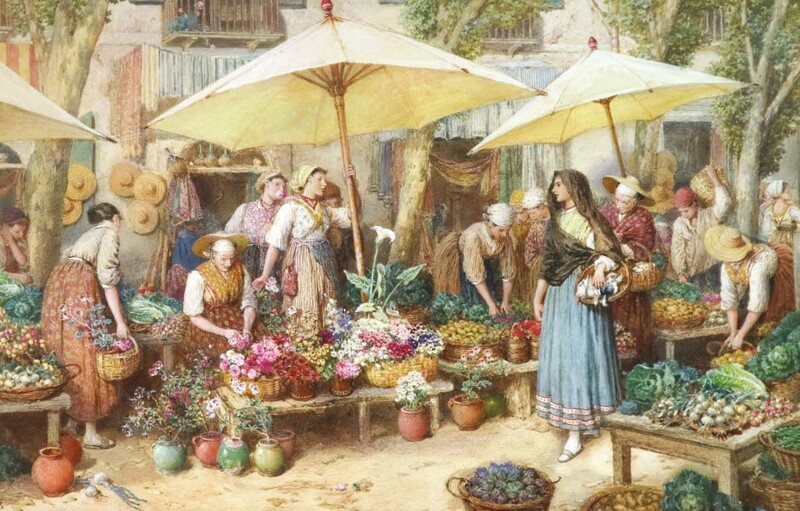 Toulon Market by Myles Birket Foster – £7500 at Halls. 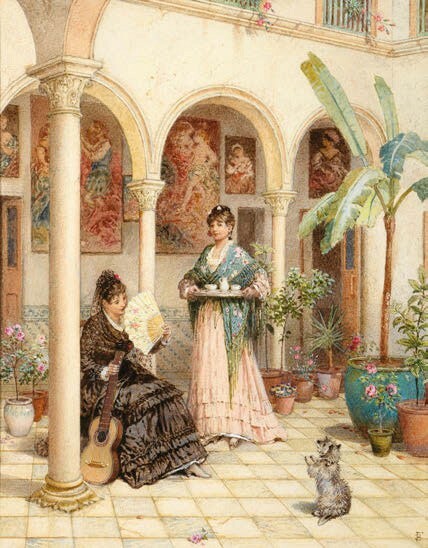 Two watercolours of continental European scenes by the Victorian painter went under the hammer at auctions last month. An 18 x 2ft 3in (45 x 69cm) watercolour, Toulon Market, was bid to £7500 at Halls (20% buyer’s premium) in Shropshire on March 20. The well-preserved and highly detailed scene of a bustling French market was estimated at £3000-5000. Patio in Seville – £2100 at Tennants. Three days later, on March 23, Leyburn saleroom Tennants (20% buyer’s premium) offered Patio in Seville. This smaller, 13 x 10in (33 x 25cm), watercolour heightened with white came from the collection of Yorkshire doctors Kamal and Margaret el Shamy. Estimated at £800-1200, it was knocked down to the UK trade at £2100. It is almost certainly the same watercolour that sold at Christie’s London in 1981 for £1300. While Foster’s continental scenes exchange hands for relatively modest sums, his sentimentalised views of the contemporary English countryside carry a premium with collectors, especially those painted after he moved to Witley in Surrey in 1862.